Sight problems are more common than we think, although it is not possible to calculate a completely precise figure for the total number of people with sight problems in the UK. About two million people in the UK self define as having a sight problem or seeing difficulty; this can range from being unable to see a friend across the street or read newsprint even with the aid of their glasses to being registered as blind. The majority (85 per cent) of people with sight problems are older people, aged over 65. The older you are the more likely you are to have a sight problem. Most people with sight problems have started to lose their sight later in life. Every day another 100 people start to lose their sight. There are four types of coloured contact lenses: visibility tints, enhancement tints, opaque colour tints and light-filtering tints. Many of these lenses are available with visual correction or on plain lenses for people who just want to change their eye colour. A visibility tint is usually a light blue or green tint added to a lens, solely to help you see it better during insertion and removal, or if you drop it. As it's a very light tint, it does not affect eye colour. An enhancement tint is a solid (but translucent) tint that's a bit darker than a visibility tint and does affect eye colour. As the name implies, it's meant to enhance the existing colour of your eyes. These types of tints are usually best used by people who have light collared eyes and want to make their eye colour more intense. Colour tints are deeper, opaque tints that can dramatically change your eye colour. They are usually are made of patterns of solid colours. If you have dark eyes, you'll need this type of coloured lens to change your eye colour. Colour contacts come in a wide variety of colours, including hazel, green, blue, violet, amethyst and grey. Light-filtering tints are a more recent development. These contact lenses are designed for sports use, because they enhance certain colours (such as optic yellow, the colour of tennis balls and golf balls), as a result of muting other colours. The result is that the ball stands out against the background and is easier to target. Wash your hands so that you don't transfer dirt and germs to your eye. 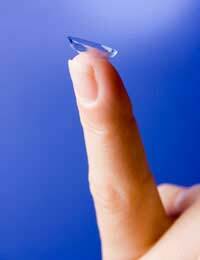 Avoiding moisturising soaps will prevent possible damage to your contact lenses. Dry your hands with a lint-free towel. Remove one lens and clean it with the recommended solution. Cleaning removes eye-produced build-up, cosmetics and other debris that impairs lens comfort. Some products require you to rub the lens in the palm of your hand with a few drops of solution, while others just require rinsing. Rinse the lens again to remove the loosened debris, making sure to take as long as the package directs: rinsing is an important step. Place the lens in your clean lens case or lens holder and fill with the appropriate solution for your soaking and disinfecting system. Disinfecting kills microorganisms on the lens. Disinfection time varies from product to product; check the package for details.